A final report on the downing of an IDF plane in last weekend’s incident, in which Israeli planes shot down an Iranian drone, is due next Tuesday, but details of the report presented Friday show that the greatest likelihood of a reason for the loss of the plane was due to a technical problem with the plane itself. It had been reported that the plane had been hit by a Syrian missile, but upon further investigation, security officials have come to believe that the plane was lost due to a problem on the plane; an older Syrian missile would not have the capability to cause a modern F-16 fighter jet to crash. Last weekend, an Iranian drone was detected over Israeli airspace in the Golan Heights. The IDF shot down the drone, and dispatched a battery of planes to attack the Tadmor air base in Syria, where the drone was dispatched from, and several other targets in Syria. The Israeli planes were met with a barrage of missiles fired by Syria, one of which was thought to have hit an F-16 jet that had a crew of two. The two pilots ejected themselves from the plane over Israeli territory, and were quickly taken to the hospital by rescue forces. Parts of the destroyed Israeli plane were found in Lebanon, Syria, and Jordan. Meanwhile, Israeli planes continued their attack on Syrian and Iranian targets in Syria. 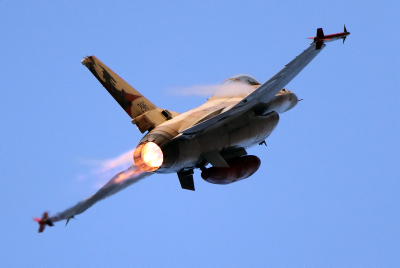 According to Channel Two, the IDF destroyed about half of Syria’s air power in the counterattack. Most of the missiles fired at the Israeli planes were of Russian manufacture, the IDF said Motzoei Shabbos, with the missile that was said to have hit the Israeli fighter jet an older version of a missile. In the Israeli counterattack, IDF planes destroyed several key Syrian missile systems, including new SA-17 systems just recently delivered by Russia. Israeli officials on Friday were quoted by Yisrael Hayom as saying that some of the Syrian missiles fell in the Mediterranean Sea; Israeli civilians were at no time in danger of being hit by the missiles. In addition, the officials were quoted as saying that the pilots were ordered to continue with their mission even if they were picked up by radar – but that they should enter defensive mode if they detected missiles heading their way. “In war, you have to expect losses, but you don’t expect a plane to be shot down as it attacks targets in Syria and the area,” the officials said, adding that the greatest likelihood for the plane’s felling was a problem with the plane, not related to the firing of the missiles.